Join us for the Best Yoga workout in Puyallup & Sumner. APRIL 8 - 19. CLASSES RESUME MONDAY ARPIL 22. Check CALENDAR for date, time, & class locations. LOWEST PRICES IN TOWN!! DROP-INS ALWAYS WELCOME!! NO experience necessary. All ages & abilities. 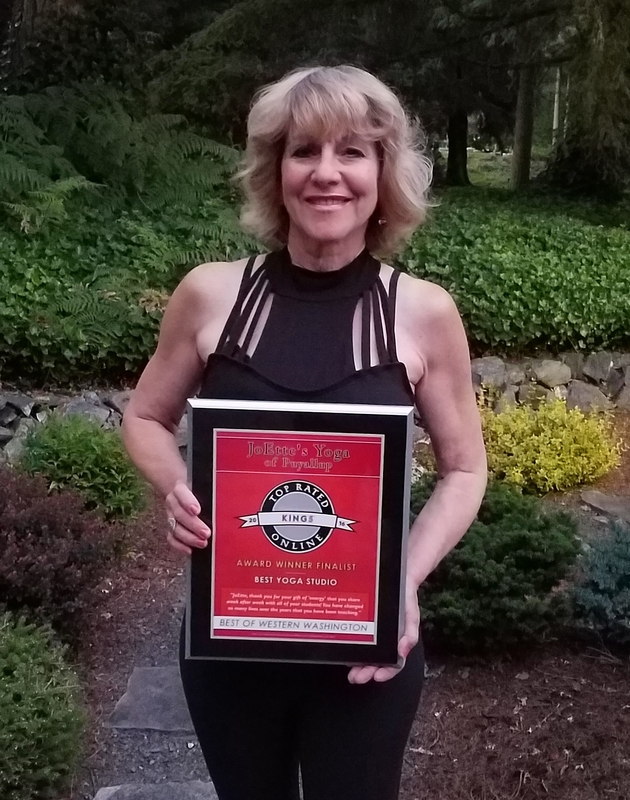 AWARD WINNER TOP 5 BEST YOGA STUDIO IN KING 5 NEWS' ANNUAL "BEST OF" WESTERN WASHINGTON COMPETITION 2016 & 2017 FOR JOETTE'S YOGA OF PUYALLUP & SUMNER. With over 30 years of teaching experience, JoEtte has something to offer everyone in her classes. Yoga Practice sessions are never a standard routine, thereby always keeping you challenged at your personal level, and growing the connection between your mind, body, heart, and spirit. MONDAYS ONLY!! 9:30AM - 10:45AM ~ RESUMES MONDAY APRIL 22! A.M. CLASS RUNS YEAR ROUND INCLUDING "SUMMER". DISCOUNTED Punch Cards: 10 classes $130. 5 classes $70. "WIN" YOGA - MONDAYS ~ 5:15PM - 6:15PM ~ RESUMES MONDAY APRIL 22! Classes held during the school calendar year. September - June. "WIN" YOGA - WEDNESDAYS ~ 4:15PM - 5:15PM ~ RESUMES WEDNESDAY APRIL 24! GENTLE YOGA FOR SENIORS 55yrs + ~ RESUMES MONDAY APRIL 22! --> An "inexpensive" YOGA MAT IS REQUIRED!! FIRST TIME GUESTS $6 DROP-IN FEE. Please stop in and visit one of the classes. Bring a yoga mat and get started if you would like. You may also Contact JoEtte: CALL/TEXT(253) 468-4750 or joette@joettesyoga.com. We look forward to seeing you in class!